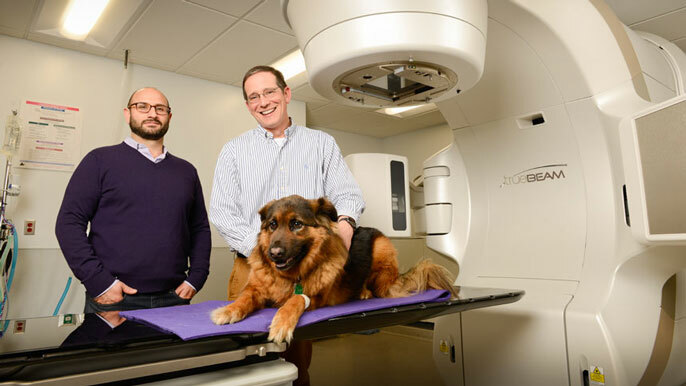 Dr. Arta Monjazeb (left), a radiation oncologist with the UC Davis Health System, and Dr. Michael Kent, a veterinary radiation oncologist, collaborated to examine a novel triple therapy to treat metastatic cancer in dogs. In my favorite childhood photo, I’m sitting in a big laundry basket in a pile of lab mix puppies. They’re licking my face, pulling on my curls and I’m laughing with absolute joy. Dogs are good at teaching us to live in the moment. But did you know they also inform us about diseases we have in common, like cancer? Melanoma, lymphoma, gliomas — all of these types of cancer affect both dogs and people. For that reason, dogs make excellent models for better understanding not only how cancer forms in humans, but also in developing more efficient treatments. For example, Dr. Michael Kent, a radiation oncologist with the UC Davis School of Veterinary Medicine, collaborated with Dr. Arta Monjazeb, a radiation oncologist at the UC Davis Comprehensive Cancer Center, to examine the use of a novel therapy in treating advanced metastatic disease in dogs. Metastatic tumors are those that have already spread to other parts of the body beyond the main tumor site, which make them the most challenging to treat. By combining conventional radiation and immune therapies for the first time in a canine clinical trial, they were able to improve effectiveness of the treatment, and extend the lives of some dogs while maintaining quality of life. Their study results recently appeared in the journal Clinical Cancer Research. This video shows Grayson the beagle, who was given less than two months to live following a diagnosis of lymphoma. Thanks to innovative treatment in a clinical trial, Grayson lived 11 more months. While Grayson passed away in April, his companion Evan says he will always be grateful for the extra time they shared together. You can read more of Grayson’s story on his Facebook page.